Abayo® is a program that can store your Passwords, PINs, website challenge Questions and Answers, Account numbers, Contact email and address information, Balances, and even personal notes in an AES encrypted database on your local machine. All data in the database is secured with your Master Password and can beoptionally encrypted to work only on your computer. To get started: Create an account. The Welcome email will have the instructions and installation password for the sample download. Enjoy! 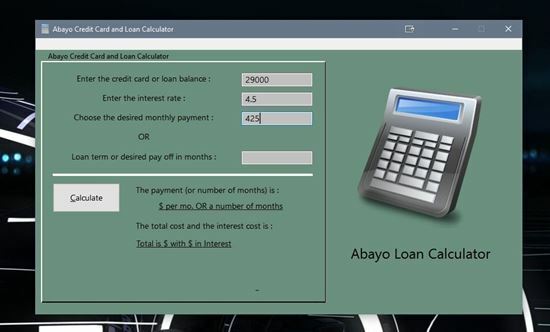 Introduction - Unlike conventional password manager type programs Abayo® uses a decoy application, a Loan Calculator, to hide the Abayo® Personal Data Vault. You can fully customize the look of the decoy so that no two look or work the same. It works like this - Correct entries allow the Loan Calculator to work just like, well a Loan Calculator. But if you enter the correct pattern of 'error' entries, then the Personal Data Vault is shown! Here you can store information for multiple email accounts, social media passwords, financial and medical website login information. Even complete documents, photos and videos can be stored in the AES encrypted database(s). If you have a large number of Accounts or Contacts, the search feature will help you find all relevant entries that have all or part of the search information you enter. For example, just enter 'ya' and all Yahoo! accounts will be shown. Calculate Monthly payments, given Loan Amount, Interest Rate and Term in Months. Calculate Term in Months and Years, given Loan Amount, Interest Rate and Desired Monthly Payment. Results show Total Cost and Interest Cost. AES Encrypted Database to securely store all information. Database self-destruct after set number of failed attempts (registered version). Launch default browser for contact's website. Launch browser to show Map of contact. Store files in the encrypted database (registered version). For example, You want to scan in and store a recent bank statement. That statement file can be stored as an attachment to your bank account entry. Any format of file (.pdf, .jpg, .docx ...) can be stored to any of your accounts. Up to 12 files can be attached to each account. Each database can have 100 accounts. You can make as many encrypted databases as you like. This makes for a convienent way of archiving statements, medical records, etc. All inside the encrypted database(s).